Convert To and From UTF-8, Unicode UTF16, UTF16 and more! After your text is converted, you can add other operations - in one pass - like sorting, search and replaces, clean up of special characters and capitalization, push the text into a database, extract text from web pages and much more! TextPipe™ works with Microsoft® Windows® 10, 8, 7, Vista®, 2016/2012/2008/2003 Server, XP x32 and x64 and earlier. Download or Buy TextPipe and install it. 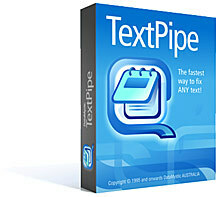 Installing TextPipe is a simple process that takes only 1 minute. 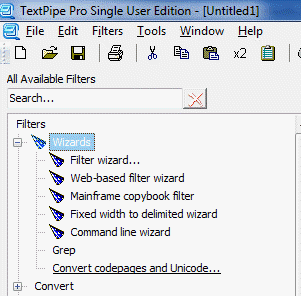 Double-click Filters\Wizards\Convert to and from Unicode. This copies a filter from the 'library' to My Filter List. 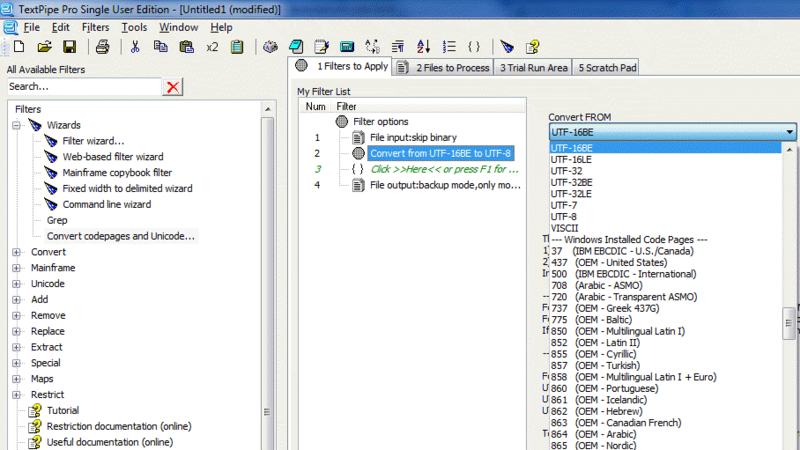 Select the newly added Unicode Conversion filter, and choose what format to Convert From (e.g. ASCII, ANSI, BIG5, BIG5HKSCS and 150 more) and the format to Convert To (e.g. UTF-8, UTF16LE). Click Go at the base of TextPipe's window, or press [F9]. Like us...you'll find yourself using TextPipe again and again for all kinds of text-processing tasks. TextPipe can detect various Unicode formats, and selectively apply conversions depending on which format it finds. In the example below, TextPipe converts all input files to UTF-8 before doing further processing. TextPipe can also apply other really cool restrictions, such as only searching and replacing in CSV field 3. Is My Input File Unicode? 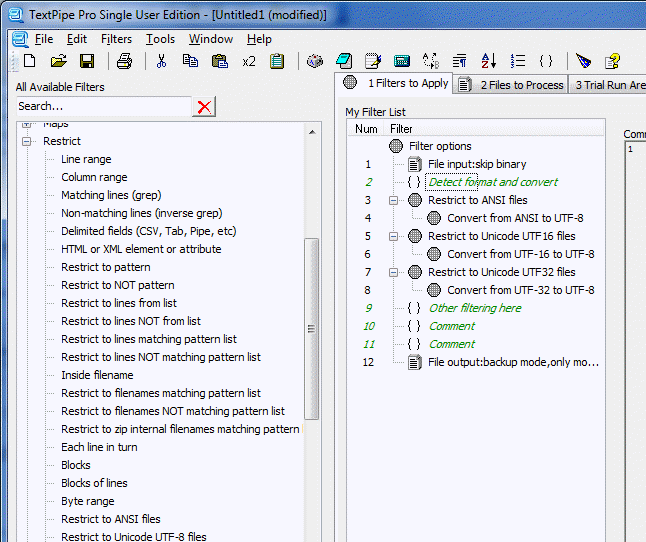 Simply drag the file to TextPipe's File Grid, then right-click it and choose 'Analyze File'. If the display says 'Unicode Encoding...' then your file is Unicode. There are 3 major formats to Unicode (UTF-8, UTF-16 and UTF-32), and variants on the last two (-LE and -BE variants). Most likely, you'll need TextPipe to convert your file to or from UTF-8 for Web pages, and to or from UTF-16LE for Windows files. Need To Convert Data Right Now? Skip the trial. We offer a 90-day money back guarantee, and accept payment online via credit card, and offline via check, wire and purchase order. Need More Information About TextPipe?